JEDDAH — To reinvigorate the spirit of patriotism and revive the commitments towards the progress of our motherland, PISJ-ES recently organized Pakistan Arts and Science exhibition. Students from across all grade levels enthusiastically participated in the expo and presented skillfully prepared working models of science and arts. The exhibition drew many community members who appreciated the students’ endeavors. 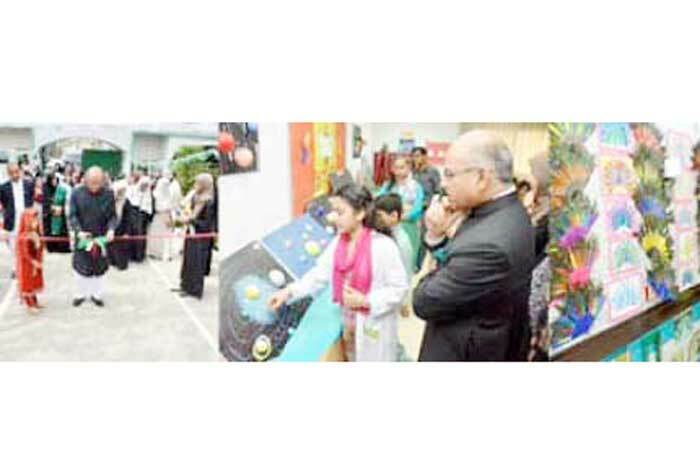 Every nook and cranny of the school displayed the ‘art of science and science of art’ in its all colors. Where the foyers and corridors of the different blocks of school were decorated with the magnificent display of mosaic lanterns, glass paintings, wall hangings with the archaic patterns inspired by the Mogul architect and designs, mirror work and Aboriginal art; the classrooms showcased the science projects including biomes, astronomy, water cycle, ecosystem, features of human body in florescent lights, the real depiction of STEM education through robots, remote controlled cars, production of hydroelectricity, the concept of optical illusions and much more. The visitors were awestruck to behold the dynamic creativity in forming beautiful chandeliers, decorative photo frames, stationery and jewelry containers by improvising on the used materials; delineating the 3 Rs’ idea of Reduce, Reuse and Recycle. The documentaries, featuring the struggle of Pakistan, multimedia presentations outlining the culture of Pakistan in the symphonies of national songs were also some of the other highlights of the day.